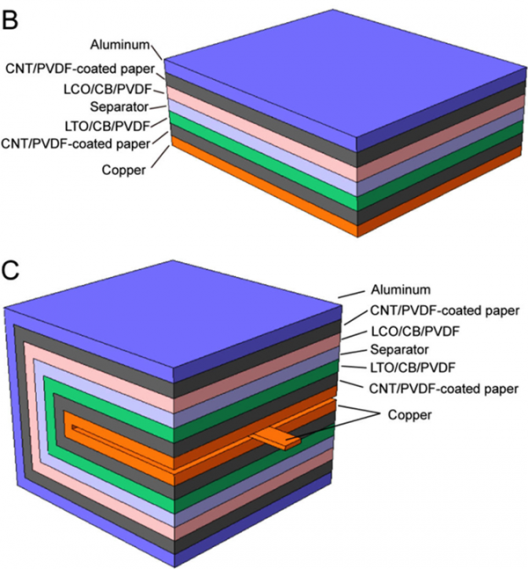 Almost four years ago, this blog reported on Dr. Yi Cui’s “painted battery,” a method of coating even paper with carbon nanotubes and silver nanowires, with the coated paper being able to store energy. Adding origami to the concept, Arizona State University researchers have folded a paper-based lithium-ion battery and managed to demonstrate a 14-fold increase in areal energy, or energy density per unit of area. This has serious implications for batteries that can be printed on roll paper and which have the requisite flexibility. More rigid batteries might crack under the strain, for instance, and achieve negative results from being folded. Researchers used lithium-ion batteries with carbon nanotube (CNT) ink for current collection, conventional lithium-based powders as electrodes, and thin, porous Kimwipes™ for the paper substrate. They added polyvinylidene difluoride (PVDF) for stickiness, to help keep the ink on the paper. Researchers tried folding the paper battery in half, and then tried a far more difficult task, folding the paper to resemble a folded map. This Miura origami folding pattern with one fold increased energy density and capacity 1.9 times. Two folds gave a 4.7 times increase, and three folds showed a 10.6 increase in areal energy density compared to a planar battery. Folding the 6 centimeter by 7 centimeter stack of 25 layers reduces the pack to 1.68 square centimeters, and gives 14 times the areal energy density of the plain sheet. Energy density increases are always less than the reduction in area because of losses caused by the folding, according to researchers. Scanning electron microscopes showed some delamination along the folds. 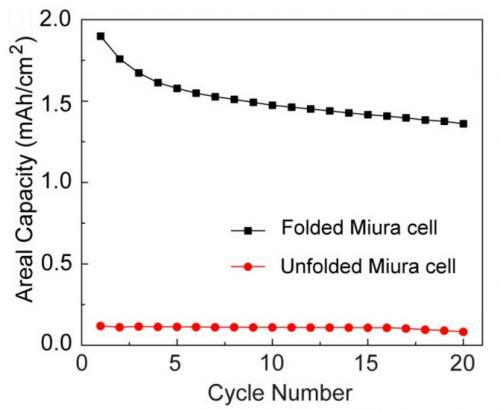 Folded batteries seem to show slightly lower performance than that of unfolded batteries, with lower discharge capacity and specific capacity, especially with 16 vertices in the full Miura pattern. 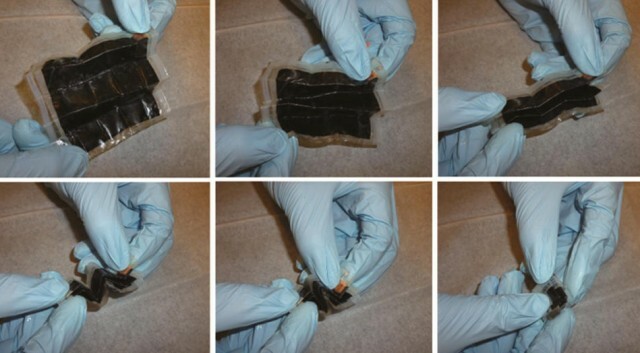 To prevent short-circuiting on the batteries, the researchers used a flexible insulating thin-film, Parylene-C, between layers. Researchers are exploring geometric folding algorithms, computational tools and robot manipulation to allow more complex folding patterns, which might allow the batteries to be manufactured in a commercial scale. The ASU team’s paper, “Folding Paper-Based Lithium-Ion Batteries for Higher Areal Energy Densities,” has been published in the September 23 Nano Letters. The areal density can be increased by more folds, and students from St. Mark’s School in Southborough, Massachusetts recently broke a world record by folding a large piece of toilet paper 13 times – well-beyond the typical bar bet limit of seven folds. With a little “brute force” at the end, the students managed to outdo Jamie and Adam on Mythbusters. Who knows where this will end?